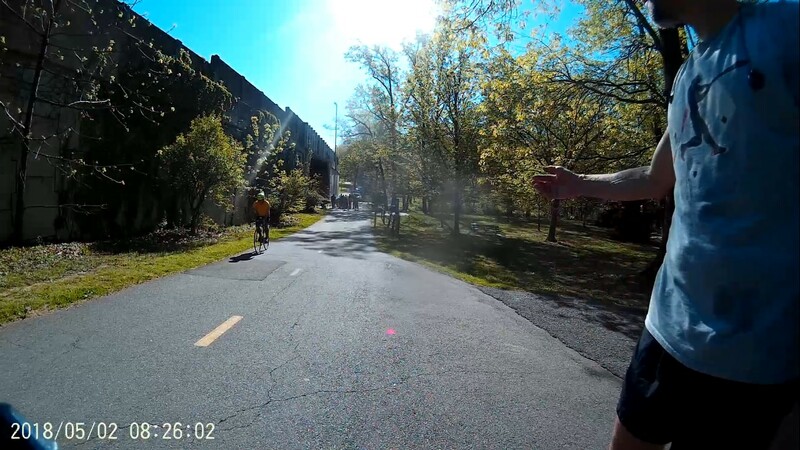 Bad wreck on the bike trail this morning. A jogger waved a warning as I approached the scene of a half-dozen EMTs loading someone onto a stretcher. I chose to exercise the bystander effect and talked with the jogger some distance from the site. He hadn't seen the incident, but said the guy "screamed pretty loud" when they moved him. It's a tricky and tight blind corner at the bottom of downslopes in two directions, where the trail turns under I-66. Yesterday afternoon I saw a close call at another bad spot, a sharp corner at the bottom of a hill where I have previously seen the aftermath of a collision. This time, a guy passed me on the downslope with an electric assist bike. You would think e-bikers would be happy to brake since they have the motor to help them get back up to speed, but in my experience they seem very protective of their momentum. He cut the corner pretty sharp, probably crossing the center line, and his shoulder came within an inch or two of the shoulder of a pedestrian walking the other way. The walker, engrossed in a smartphone world, never knew what didn't hit him. Would have been good for the highlight reel but I had earlier stopped the camera when trying to make sure it was on.